The common thread linking each of these albums is bassist Peter Marsh. A versatile session musician who has worked with artists as diverse as The Tiger Lillies and The Orb, Marsh is also a seasoned improviser. He co-founded electro-jazz sextet Lob in 1995 and, when they split in 2002, continued with three bandmates as the harder-edged Moist until 2007. Since then he’s been involved in various bands, some of which – including the three under review – are documented on the Forwind imprint. 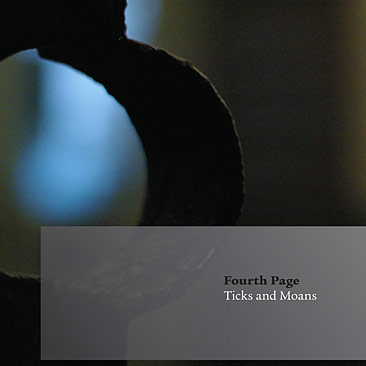 The individual members of Fourth Page have a lot of common history. Marsh and percussionist Paul May have played together in various groups, including Elvers (see below), and as the live rhythm section for singer Petra Jean Phillipson; May and pianist Carolyn Hume have recorded as a duo for the last decade, releasing five albums on Leo Records; and singer/songwriter and producer/engineer Charlie Beresford recently hooked up with May and alt-bluesman Duke Garwood (who now has a collaboration with Mark Lanegan in the pipeline) to record as as Abdon Liberty. Marsh, May, Hume and Beresford came together as Forth Page in 2010, and released two albums – Along the Weak Rope (Forwind) and Blind Horizons (Leo) – in 2011. Fourth Page play improvised songs. Their music has been compared to both Paul Bley and Schubert, and I supose there’s an abstract truth in that, but the comparison that best works for me is with the single solo album recorded by Talk Talk’s Mark Hollis. There are also distinct traces of British ‘lowercase’ quiet improv at work here, alongside occasional hints of folk and an affinity with outsider artists such as Richard Skelton or Richard Youngs. Ticks and Moans was recorded live with an audience at St Leonard’s Church in Shoreditch, London, and the hushed acoustic emphasises a characteristic reticence in Beresford’s vocal delivery. In improvising the lyrical content of these five songs, he only occasionally hints at the heart-stopping boldness of the way Hollis could suddenly crystallise a hitherto diffuse melody, but here the song is just one strand in a complex evolutionary process. The instrumental lines are, at the very least, equally eloquent. This being improvised music, the duty to hold things together without locking anything down falls squarely on the ‘rhythm’ team of Marsh and May. It’s May’s march-time snare, anchored by Marsh’s emphatic contrabass pulse, which defines the shape and mood of “Calm Against the Bleak”, but it’s clear that the contours of the piece could yield at any moment to an intervention. There’s little room for anyone to show off with solo set pieces, but Hume more than anyone takes her chances to shape jewel-like solo statements. Beresford introduces “Touch” with a brief solo on the khaen, or Laotian bamboo pipes, but for the most part the album’s five tracks develop organically. Once a piece is established there’s no settling in to formulaic tropes; the group’s constant alertness is perceptible. Inevitably, the band are at their most impressionistic during introductory, exploratory passages that precede a collective yielding to a particular direction. This process is clearest on the closing track, “Summon Me Back”, which takes shape only very gradually, but also on the intro to “Ticks and Moans”. Witness six minutes in, where the rhythm team lock onto something implicit in Hume’s improvising to insinuate a snappy, agitative rhythm pulse. David Sylvian explored a similar fusion of improvisation and song on his Manofon album, but he failed where Fourth Page succeed in fully integrating the two forms, and moreover Fourth Page do it live. For those of us who missed their recent dates in the UK, the band recently posted on YouTube a short film, “A few scenes from the Fourth Page Tour, Summer 2012“. 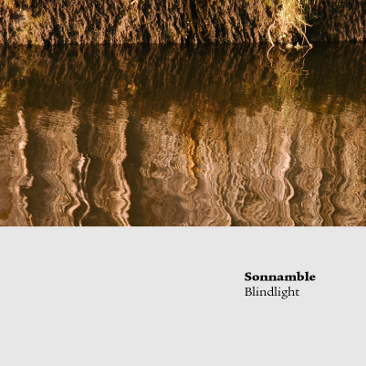 On Sonnamble‘s Blindlight, Peter Marsh’s double bass is second fiddle to his lap steel guitar. He’s partnered by Conor Curran on analogue synthesizer and live processing. Sonnamble aren’t the first to combine improv with real time digital processing, but they operate in that ill-defined juncture between the single-source electronica of Fennesz and Evan Parker’s Electro-acoustic Ensemble. Marsh’s lap steel produces reverberant sustains and soundings transformed by Curran’s custom software into gauzy drones, fluctuating surges of pure tonality, and bursts of atomised electronic stippling. It’s frequently, dazzlingly beautiful. Each of the four pieces – “Aphelion I” “Aphelion II” “Blindlight” “Society” – has it’s own character (“Society” is structured around a distressed recording of an Irishman holding forth (often inaudibly) on society’s treatment of the mentally ill, much as Godspeed You! Black Emperor used spoken word samples in their early work), but this short album is best experienced as an immersive whole. Last year, Sonnamble expanded to a quartet with the addition of Fourth Page percussionist Paul May and voiist Wei-Ya Lin for live dates in London and Vienna, and their next album, which is due out soon, will draw from those sessions. Meanwhile Blindlight is a real discovery, which I’ve found highly addictive. The oldest of these three recordings, Elvers reunites the Marsh/May rhythm section with an old friend, Lob trumpet player Ian R. Watson. 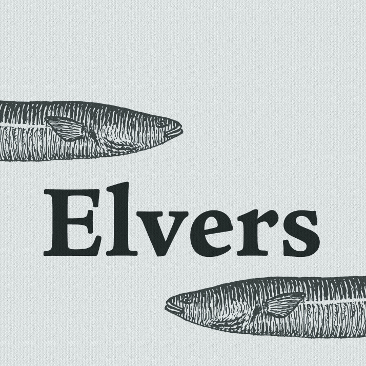 Formed in 2008, Elvers set out, according to their Forwind bio, “to explore a shared interest in improvised music making without rules, particularly improv rules”. Watson’s rejection of the default machismo in improvised music has consigned him to the margins somewhat, but he’s been constantly active over the past twenty years or so. He played on Spring Heel Jack’s Demised in 2000, and both he and Marsh took part in many of Ashley Wales’s ‘Back in Your Town’ concerts at North London’s Red Rose Club, circa 2005-7 (I saw Lob play a memorable concert there with the late saxophonist Lol Coxhill sitting in). He’s also played with Solus Rex, 64 bit, and currently has a duo, The Treecreepers, with Bellowhead percussionist Pete Flood. The four pieces here, each named for a type of eel – “Wolf”, “Sawtooth”, “Cutthroat”, and “Conger” – are a reduct form of improv that places more emphasis on harmonics and the textural grain of acoustic sound than on its rhythmic drive or melodic contours, although as Marsh’s insertion of a resonant, loping bass rhythm into “Sawtooth” suggests, there’s very little pretension in their playing, and certainly no ideological opposition to the rhythmic imperative that stiffens the sinews, however sublimated. Woven Entity – Woven Entity. Freedom of the City 2012. This entry was posted in Album and tagged Blindlight, Carolyn Hume, Conor Curran, Elvers, Forwind, Fourth Page, Ian R. Watson, Paul May, Peter Marsh, Sonnamble, Ticks and Moans. Bookmark the permalink.